My Husband and I have a disagreement about a Christmas present for our 9 year old son. I think an Nintendo DS is an appropriate gift. Or even a 2nd generation iPod Touch we have laying around the house that was never opened. I envision him listening to his own music (mostly Micheal Jackson), audio books (Magic Treehouse), YouTube videos (stop motion homemade Lego movies) and games. Yes, both are expensive gifts for a child his age, but I think it will teach him responsibility and will be a very special gift. The Husband is set on selling the iPod Touch on Ebay. (He had won it in a contest at work, and being the Android Family we are, we never even opened it.) We came up with a comprise of sprucing up our old G1 instead and wrapping it up for him. A cool new cover (what boy doesn't love skulls) and headphones, his favorite free games and a few paid (Hello, Pocket God! ), his music, links to Lego.com and his favorite sites. The phone will not be enabled, so no cell phone usage yet, just wifi. He already has a gmail account that we encourage family and friends to contact the kids with (and we monitor) so he can really start using it. I suspect the Husband thinks it will spark a bigger interest in coding in the little guy too. Whenever we are on a road trip or waiting anywhere, the kids constantly ask for our Android phones to play with. Usually they are in use for GPS Navigation, Music player or just plain old phone so they don't get it. One morning I couldn't find my Nexus One as we left the house and I asked the kids. The 6 year old pulled it out of his toy box "Oh, here it is". So I think this will solve several problems for us. What do you think? Is that too much for a young child or do your kids already smartphone? I don't see a direct way to contact you, so hopefully this works :) Have you seen a grocery list app that lets you add items to multiple stores? 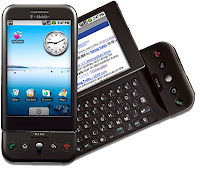 I used JShopper on my Palm Treo and loved it. I could add an item and then add it to the list for two different stores, that way it would show up on both lists. I can't find anything like that in the Android Marketplace, or even anything that nicely handles lists for multiple stores. Any recommendations? i like our groceries, you can have multiple lists and it can sink with your spouces list also so if you are both shopping at different stores or other sides of one store and one of you marks off an item the other list shows the item already scratched off also. Tessa - Ill review a few more grocery apps this month. I liked Grocery IQ on the iPhone and that did a list that would show on multiple lists. BTW - the boys LOVED their hand-me-down phones for Christmas! My 6 year old has been rockin' the headphones constantly and they are a great reward/incentive system in our house now! It's good that you write about it.